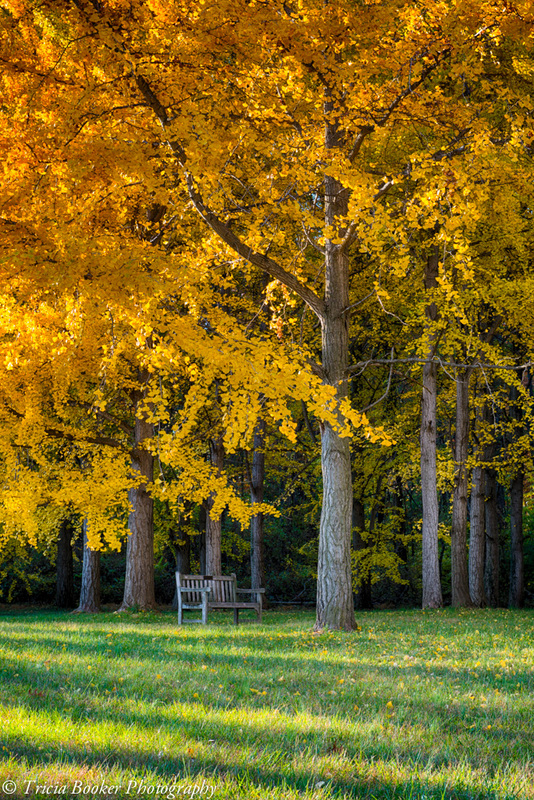 This fall, I monitored the Ginkgo Grove at the State Arboretum of Virginia on a regular basis, just waiting for the opportune time to photograph these glorious trees as they turn golden-yellow. Several times when I thought they’d be at peak color, I arrived to find they were still primarily green with just patches of yellow. The Ginkgo is native of China and long revered for its medicinal qualities, as well as beauty. There are more than 300 trees in this collection, which draws many visitors during the fall. Last weekend I ventured out several times, meeting many other photographers who were spending time with these trees, one of the largest groves of its kind in the United States. Unfortunately, after missing the beautiful evening light due to cloud cover on two visits, a cold front blew through taking many leaves with it but also clearing the skies. I returned that evening to find a few patches of gold remaining and was rewarded with some vibrant images, which I edited slightly in Nik Color Efex Pro and Nik HDR 2 to enhance the highlights. Nature and solitude–the perfect combination. Lovely. Thank you, Sally! I appreciate your comment. great photo tricia. The color out in the Winchester area is incredible this year. Thank you, Rob! Yes, we have had a very nice fall season this year. I hope you were able to get out and enjoy it, too! Definitely the perfect place to sit with a coffee and enjoy the autumn colours around you. Lovely autumn capture! Magnificent, Tricia! I can imagine spending hours under these trees to soak up the rare beauty. Thank you so much for stopping by, Karen! I hope you are having a wonderful fall season! Thank you, David! It’s a wonderful place for photos, that’s for sure!